Without realizing, many people will often try to find ways to make their lives just a little bit easier. Like walking through a shortcut rather than taking the road all away around to get home, or laying out your outfits the night before so you aren’t rushing to get ready the next morning. Life Hacks by Annabel Staff provides all sorts of interesting and innovative ways to help with everyday common problems you may encounter. When you want a cold glass of wine without having it be watered down with ice, what do you do? Use frozen grapes of course! Inside this book, we were able to find a bunch of uncommon solutions to help us out with everyday obstacles. From cleaning tips to cooking tricks, this book has it all! Throwing an impromptu party? No need to break out fancy serving dishes. Use what you have, like this awesome idea for filling a wineglass with dip in a chip bowl! These little life hacks were developed to make your life easier, so what are you waiting for? The possibilities are endless, get going! Life Hacks: A strategy or technique adopted in order to manage one’s time and daily activities in a more efficient way. – Oxford English Dictionary Ever burned your fingers trying to light a hard to reach candle wick? Try spaghetti! Just how do you separate the yolk from the white of an egg? Use a plastic bottle, of course. When your ice-lolly starts melting, how do you stop your hands getting sticky? 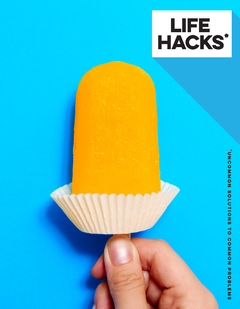 By using a cupcake wrapper, naturally… This book contains over thirty solutions to everyday problems encountered in the home or out and about, with each life hack demonstrated in a full colour photograph for easy reference.